Ekofluid supplies high vacuum oil treatment and regeneration products and services for the energy industry, with clients that include transmission and grid operators, power generation providers, and transformer maintenance companies. The firm focuses on researching and developing the current design of oil regeneration and treatment equipment, and has established its own REOIL and FILOIL brands. Ekofluid has an ISO 9001-certified quality system, an ISO 14001-certified environment solution, and a servicing unit that also holds the SCC safety management system certification. The firm produces the FILOIL transformer oil purification plant that has a positive displacement rotary inlet pump. 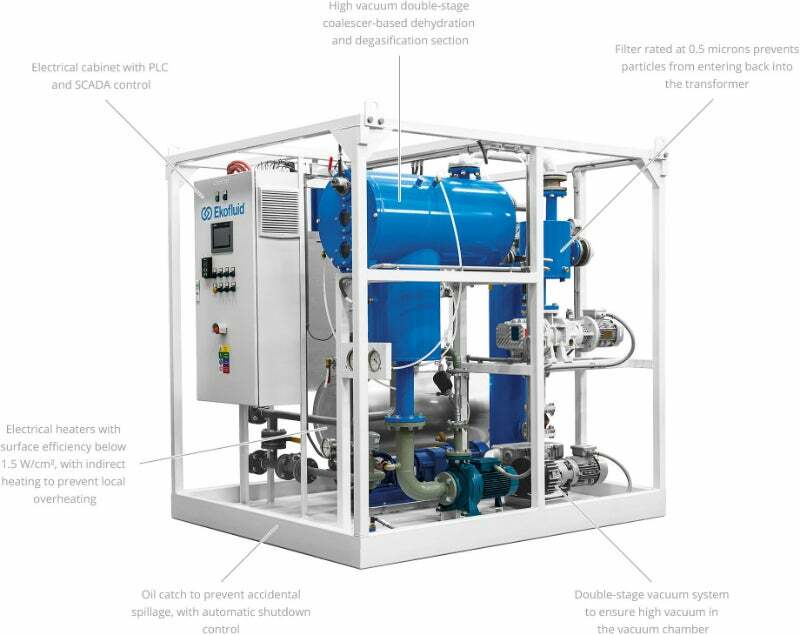 The outlet system features a centrifugal, closed-coupled high-suction pump, as well as a vacuum / booster roots pump designed for drying and taking away gases from the rotary vane. Ekofluid’s oil treatment plant holds a large amount of coalescing filters in its vacuum compartment. These filters ensure that the oil is treated as efficiently as possible. The equipment has automatic variable oil flow control, ensuring maximum comfort when in use, while the vacuum and pressure sections of the treatment plant are divided by vacuum breaking valves. To warm the oil, Ekofluid’s plants use electrical heaters that have a surface efficiency of below 1.5W/cm². The system heats the oil indirectly to ensure it does not overheat. Before the oil is sent back to the transformer, the outlet’s 0.5µ filter cleans the oil, removing any solid particles. Equipment is fully automatic, controlled by PLC logic, and interfaced with a supervisory control and data acquisition (SCADA) system. Numerous safety features are introduced throughout the plant to ensure protection of equipment and operating personnel. The safety of the FILOIL treatment plant is guaranteed by its aeration vents, protection against overheating, and automatic level functions. These features allow the equipment to evaluate risk and shutdown to avoid accidents. Ekofluid’s treatment systems are offered in oil flow ranges starting from 1,500l/h up to 12,000l/h. Over time, oxidation by-product levels increase, causing a rise in the oil’s acidity, as well as decreasing its interfacial tension. At this point, the oil begins to lose its dielectric properties. To avoid deterioration and damage to the transformer, Ekofluid’s REOIL regeneration plant restores oil to its original state, highlighting the company’s ability to go beyond IEC 60422 standards. The regeneration plant functions in the same way as Ekoluid’s FILOIL treatment system, but instead uses a rotary piston roots pump for the reactivation stage and has pneumatically operated automatic ball valves. The plant features flexible capacity and the capability for sorbent reactivation. Ekofluid’s regeneration plants are modular in their design and supplied with or without the degassing section. This allows the equipment to be combined with the oil treatment system if needed. The company offers corrosive sulfur removal services using the REOIL equipment. Ekofluid was established in 1996, introducing oil regeneration services to Europe. In 1997, the company created its first servicing unit and started to establish its purification plants for customer use by 2000. In 2010, Ekofluid expanded its services in order to offer worldwide access to plants. Since 2014, Ekofluid has been based in Vienna, Austria.